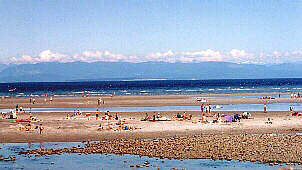 The City of Courtenay, BC, is the urban and cultural hub of Vancouver Island's Comox Valley. Located along the Courtenay River in the heart of some of the Island's most beautiful faming land, Courtenay is a bustling metropolis with galleries, theatres, shops and restaurants. Downtown Courtenay is considered one of the most vibrant and charming downtowns on Vancouver Island. In additional to unique shops, services and eateries, Courtenay is also home to an incredible cultural district that includes the Sid Williams Civic Theatre, Comox Valley Art Gallery and the Courtenay and District Museum and Paleontology Centre. 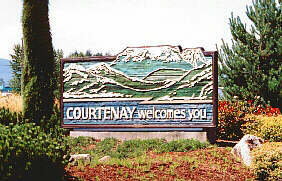 Courtenay, named after a British sea captain, is the urban centre of the Comox Valley and has a rich heritage influenced by farming, logging and fishing. For the visitor to Courtenay, BC, each season has something special to offer. It is a year round business getaway and shopping centre. Summer is a creative season, filled with music and art festivals plus a variety of craft fairs. The warm months also give visitors to the Courtenay area a chance to see such sites as the Puntledge River Fish Hatchery, explore the majestic scenery of the Comox Valley or laze on Goose Spit, one of the finest beaches in the Comox Valley. Others may like to venture out onto the ocean for fishing, sailing or even sea kayaking. Winter, skiers can head to nearby Forbidden Plateau and Mt. Washington. For those interested in history, the Filberg Lodge in nearby Comox, offers a look at the past; it is also part of the present, being the site of the annual Arts and Crafts Festival. 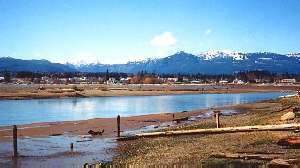 Access: Courtenay, BC, is 60 km (37 mi.) north of Qualicum Beach on Highway 19 or 220 km (137 mi.) north of Victoria on Vancouver Island. The area is also serviced by bus, rail and CYQQ airport. Recreation Facilities & Activies: golf courses, fishing, boating, swimming, skiing at Mt. Washington. Local Attractions: Arts & Artisans Gallery, Historic Museum, Forbidden Plateau & Mt. Washington ski areas, Goose Spit Beach, Miracle Beach Nature House, Native Sons Hall Museum, Puntledge Fish Hatchery, Seal Bay nature park, Comox. Events: The Comox Valley is always entertaining. Whether you are interested in music, theatre, dance, art, crafts, sports or wildlife - we have an event for you! Check local info centers for events, dates and times.